If you’ve decided to go into business for yourself and you’ve recognized that the Internet presents limitless opportunity then you probably have a million thoughts and ideas running through your head. Maybe you’ve even downloaded and read my eBook, “Stop Chasing the Carrot,” and you’ve begun to brainstorm and plan for your future business. Once the decision to start an internet marketing business has been made the excitement begins to overwhelm. There are likely tons of ideas and questions coming at you and it can be difficult to sort through the noise and find the worthwhile ideas and the relevant and important questions. But What About Your Business Ideas? Which ideas are worthwhile and which ideas should be forgotten? I’ve learned that there are three essential steps to take to evaluate any business idea that you imagine. Step #1 – Do You Have Passion, Interest, and Enthusiasm for the Idea? Just because an idea is a good idea, doesn’t mean it’s a good idea for you. You may know that there’s huge demand for an information site about Do It Yourself Rug Making and a potential to make good money. However, if you have zero interest in that topic, it’s not the right idea for you. You want to be able to imagine talking and writing about your business topic every day for the next ten years. If you cannot do that, it’s not the right idea for you. If you’re stumped for ideas, consider starting with a list of topics that you’re passionate about and/or interested in. For example, maybe you’ve always wanted to learn to rock climb. You could start an information site about learning to rock climb and your audience can learn with you. You don’t have to be an expert in your chosen business; you do have to be excited about it. Step #2 – Do You Have an Effective Business Model? Some business models are better fits. For example, if you’re interested in a membership model and charging a subscription that might not fit with the rock climbing topic idea. However, an information marketing model might work if you are interested in creating climbing guides and how to information. Explore your options to determine the best model/topic match and know that there are some profitable ways that you can combine business models to maximize your profit potential. 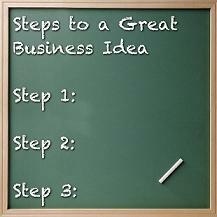 Step #3 – Does Your Business Idea Offer Value? This is your research step. You’ll want to ask friends, family, experts, and your potential audience what they think of your business idea. Also begin to outline the benefits your business will provide. What problems will you solve and how will you solve them? If your idea doesn’t offer anyone any value or benefit, it’s not a viable business idea. Always be able to answer the question, “what’s in it for me” from your potential customer’s viewpoint. These three questions should help you narrow down the business ideas that you have until you find the one that feels right and is supported by solid market research. Don’t skip these steps! Your internet marketing future depends on it. Follow us on Twitter! | Like us on Facebook! Watch us on YouTube! | Pin us on Pinterest!